New IF discussion guidebook on Crime & Punishment now available - Interactivity Foundation - Engaging citizens in the exploration and development of possibilities for public policy. Orange is the New Black may be the hottest new show on Netflix, but Crime & Punishment is the newest discussion guidebook published by the Interactivity Foundation. 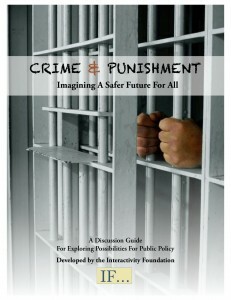 You can get a pdf copy of this new discussion report from the link on the Crime & Punishment discussion page on the IF website. And printed paper copies should be available upon request to IF’s main office in a couple weeks.